The last two months, after posting the last update, have been very hectic when it comes to activity. For this, and technical reasons causing several drafts to disappear, has caused me to update less than I intended. However, with it being three years approximately to the inception of the blog, I felt it was important to get out some kind of update as both motivation and to let interested parties know as to how things are going. That said, I will try and launch straight into the updates. Firstly, and most importantly, Hecates stellar gate has been successful carved, blooded, and opened in ritual releasing unique and important gnosis. This has clarified some longer term goals on my path. The Stellar Gate itself comprises of two, important sigils, one being her full, revealed and activated stellar eye and that of her own, specific sigil relating to her stellar gate. These were etched into a birch endblock, and inked as described in an earlier posting, accompanied by four, surrounding words of power. These words of power consisted of Hecates name, that of two of her appropriate titles, and the name of the Stellar Toad all written in Theban script. This prepared block was cleansed with Sandalwood incense and water, and in ritual from within the circle with both sides of the tree opened and Hecate invoked into the flesh, empowered. The exact method for this has to at this time remain secret, but involved a specific way of consecrating the block at six, cardinal directions using a specific vocalised stellar key. It also involved some semi circle breaking work to draw in the powers directly from opened conduits, acting as a lightning flash between direction, block and practitioner. Once correctly opened, Hecate elevated the level of the possession utilising the power of the gate. The level of the possession became strong, and direct, Hecate assuming an insect like form to merge with my own. At the height of the possession and union, the energy released was explosive revealing knowledge of two, new stellar keys as well as a specific, gate construction. Gnosis was delivered as to the full structure of both the keys, and the gate, alongside some clues as to its intrinsic nature. The nature of this possession was exhausting, draining even, being different to the usual kinds of possession experienced. However the conciousness was expanded, and in the days that followed several blocking elements in the work were removed. It was at this time that I received my new Athame. I had contacted a smith to create a bespoke blade for Hecates craft, but numerous issues had prevented it from making its way into my hands. After only a few days, I received correspondence to let me know, out the blue that it was on its way. After a brief but slightly eventful delivery, it finally arrived and, through intuitive workings with the Gods, was consecrated. The blade is made from Damascus steel, and features a curved silver crossguard and the hilt is made of black ebony. Its empowerment was done from within the circle, at the four cardinal directions, with Hecate invoked into the flesh. The hilt was decorated with two, simple sigillic constructions as directed, and the blade was treated with a mix of plant essential oils, one for each element. I hope to in the near future write a small, descriptive PDF of this process for those who wish to construct a similar blade that is specific to the current of the Trident. This is not to suggest there is an orthodoxy to this process that I feel is likely extremely personal, but hopefully it will offer a springboard for people to base off further ideas. 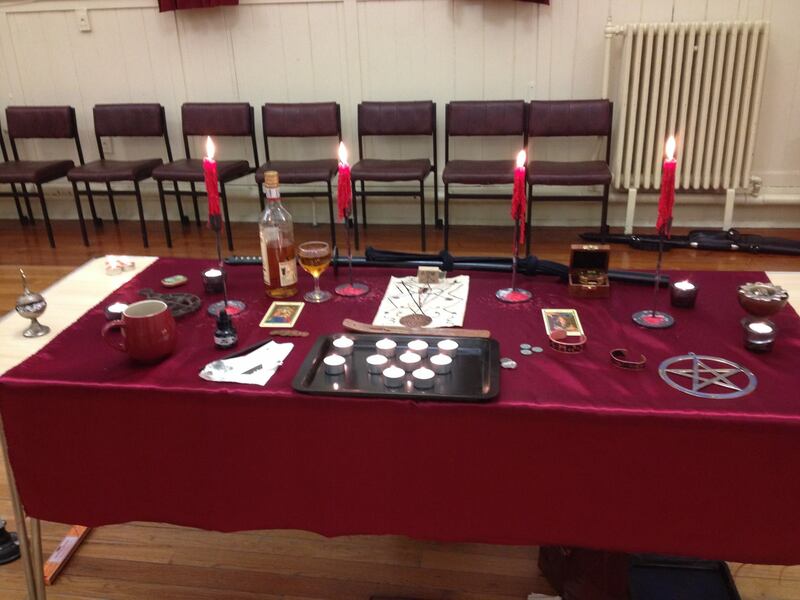 Lastly but not least, for Beltane celebrations I ran a working dedicated to Lucifer, invoking his stellar and light bearing aspects. This work consisted of two main parts, due to falling several days later than the actual sabbat, on the black moon. The first part was the opening of a central cauldron of water, to the black moon, in Lucifers name. This cauldron was then used to cleanse, banish and remove malefic ills specific to each individual. Through it Lucifers fire was also drawn, as the height of the black moon ebbed. The new, growing influence of the moon was then used to conduct a group working, petitioning Lucifer to assist and speed up in the healing of the Earth and the rebalance of its world soul via awakening the souls of man. The Altar after specific, personal items had been removed. Thanks to the photographer on the day. Central to the work were two, temporary sigillic gates initially opened in a preliminary work on the Sabbat rite. These were created via automatic writing in possession with Lucifer, and were created as exoteric seals to channel the solar and stellar energies. The first was a variation of his primary sigil, oozing the energies of his lightning flash, and the second was a variant on Hecates Sabbatic Eye infused with his solar energies. The first was used as a primary conduit as part of the altar work, the second the seating sigil for the large, brass cauldron. Added to the cauldron was a mix of plant essential oils, salt, and a exceptional offering gifted by one member of the group. This offering took the form of a triskele created from copper. This was activated, and used to seat additional energies within the cauldron itself. I felt the working went very well, the energies being correctly channelled and applied, and this was echoed in the feedback from the group. It is always a pleasure to be able to share what an be shared of the craft and introduce others to these entities in their true forms, especially when it comes to a much maligned entity such as Lucifer that is covered with many masks. Finally but in no means least, The Rite of Her Sacred fires will be being held on the full moon of May. This rite is open to any who wish to participate, and is partaken in by many devotees of Hecate since its inception in 2010 by Sorita d’Este. I have performed the rite as prescribed in the past, and it was always an enjoyable and beautiful experience. This year, I will be participating in my own way by incorporating it into wa orking with Hecates opened gate. I encourage all others who have a connection or calling with her to give it a shot. More information about the rite, as well as a much better writeup, can be found at the Covenant of Hecates website by clicking the image below. I hope you have had a fantastic May so far, and hope that it brings many opportunities in the craft to come.